Let's say your 2 bed apartment is priced at taking 2.5 hours to clean, then that is what you will be billed for each clean, regardless of whether our cleaners took 15 minutes more or 15 minutes less. 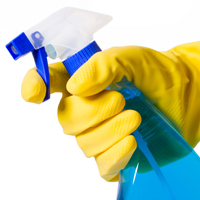 We work on the basis that across all cleans for your property, there is an average amount of time spent. That is what we charge. This is reviewed annually. We do ask however that guests try and leave the property as they found it. Our Cleaning Services are available to Key Holding clients only and are not available to guests that have booked their stay in the property through a local letting agent. Cost of service - CHF 40 per hour.